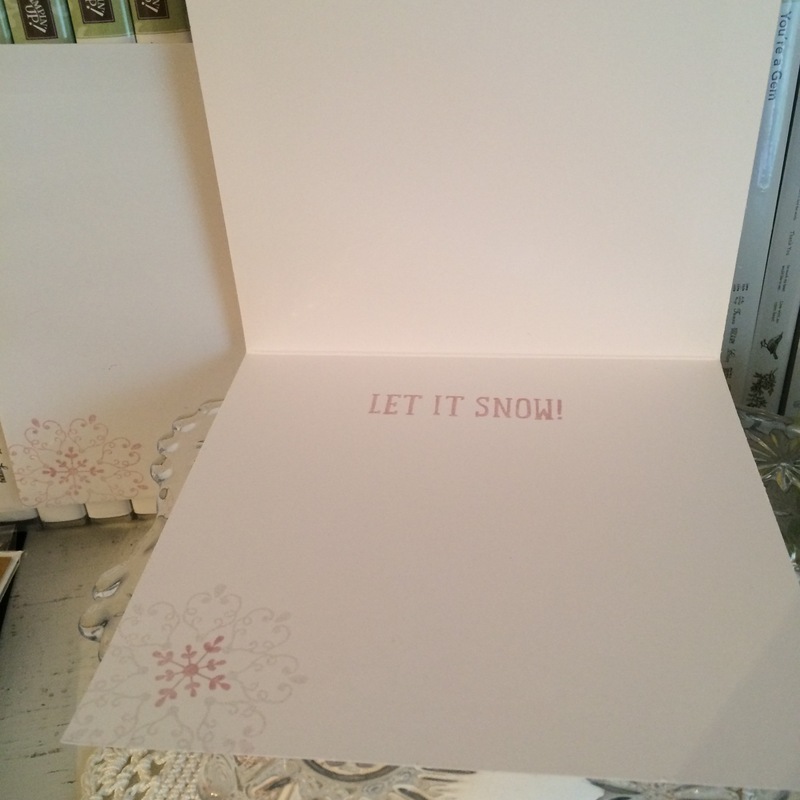 It’s time to start making Christmas cards! 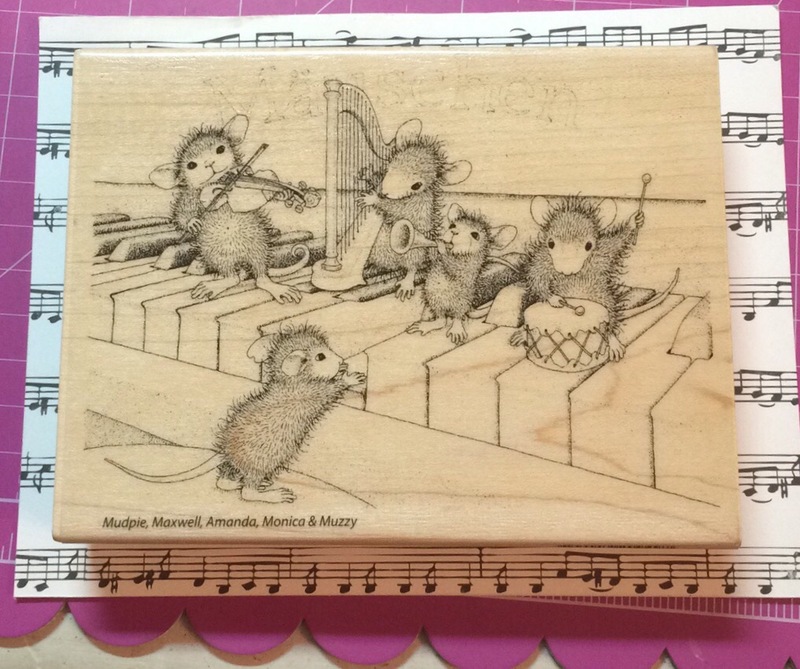 Okay, it’s probably past time, and I’ve been creating them for a couple of weeks, but here’s my first blog post about one. 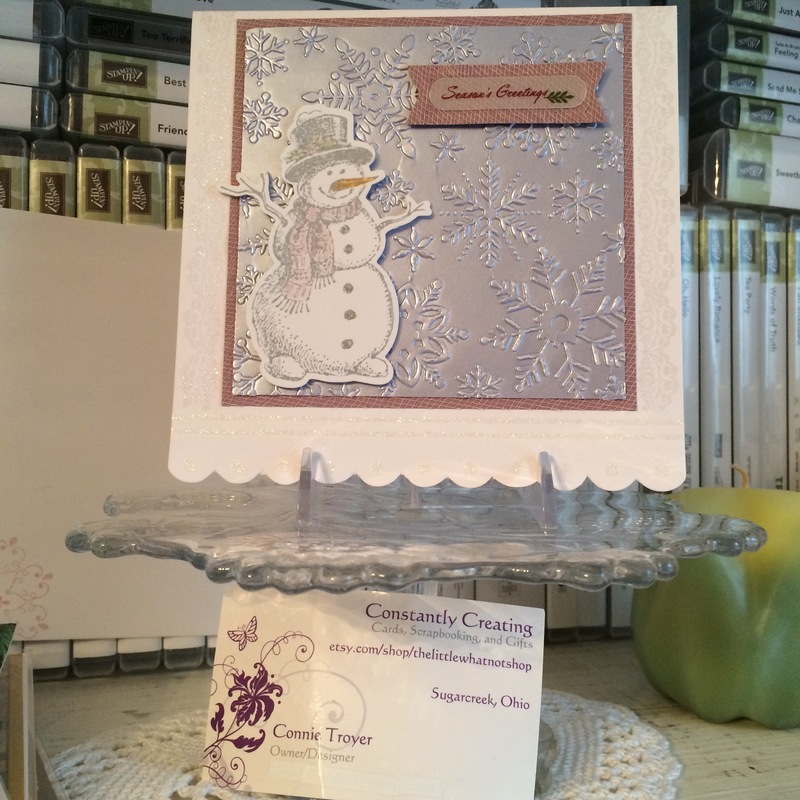 It may be October, but for crafters, it’s Christmas card season! Pardon the mess behind my desk, but this is the only shot of the four together so far. 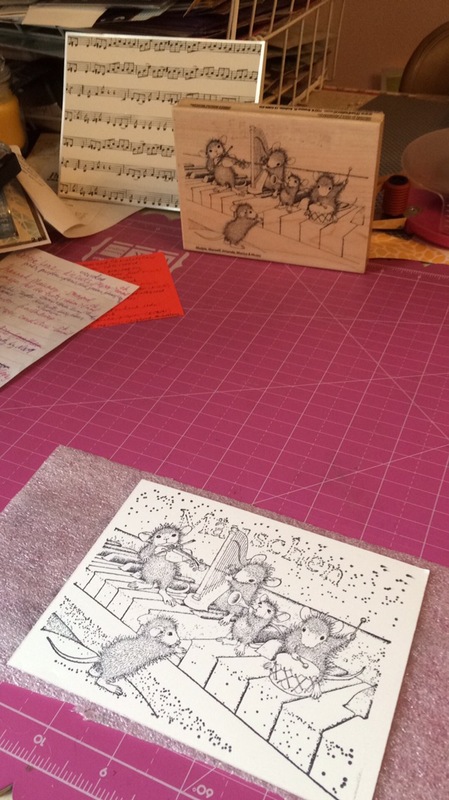 I have two custom Christmas card orders right now along with the niggle of something bigger in the works (we’ll see if it goes anywhere), so I figured all four would go one place or the other, or I could split them up. 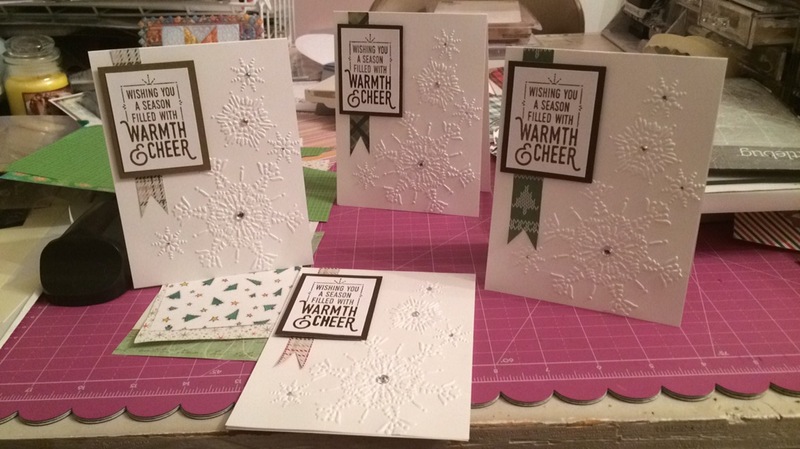 I used all Stampin’ Up materials for these except for the bling – Whisper White cardstock, the retired Northern Flurry embossing folder, paper strips cut into banners from one of their retired 6×6 Christmas paper packs (I didn’t write down which one), Soft Suede and Early Espresso inks with matching cardstock, and the “Wishing you a season filled with warmth and cheer” sentiment from the set “Wrapped in Warmth.” The rhinestone bling is from Michael’s, SU, and CTMH. I’m still stamping the insides of three of them. So far I have “Merry Christmas to You and Yours” (from SU’s “To You and Yours Too” set) on the inside of the Soft Suede version, shown below. 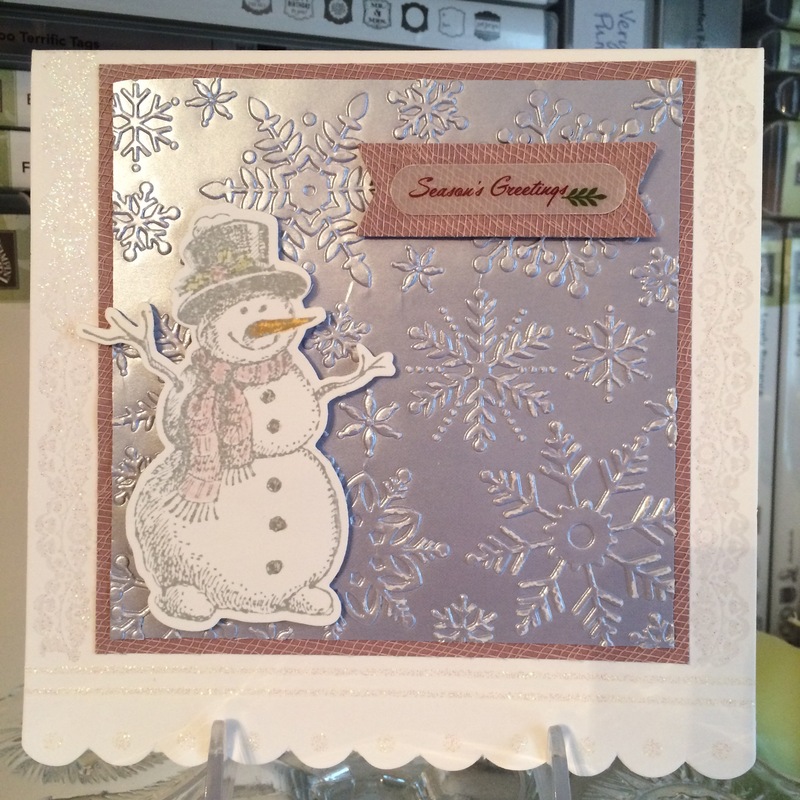 I used retired Stampin’ Up Lucky Limeade cardstock for my card base. I try to make all my card bases with SU cardstock, which is 80-lb weight paper. I like the variation of the older textured papers too. Sometimes a girl just needs a little texture in life. Also, Lucky Limeade is one of my favorite colors that Stampin’ Up has ever made. I wasn’t buying from them when it was a current In-Color; I came upon it after it had recently retired. But it has proven to be one of my go-to colors ever since. I even like it instead of Old Olive most of the time. I also have a thing for square cards. This tends to be a problem because they cost more to mail, as they are considered an unusual or irregular size. (Yeah, don’t ask me how a square card can be irregular, but there it is.) They have trouble going through the mail machines, apparently. 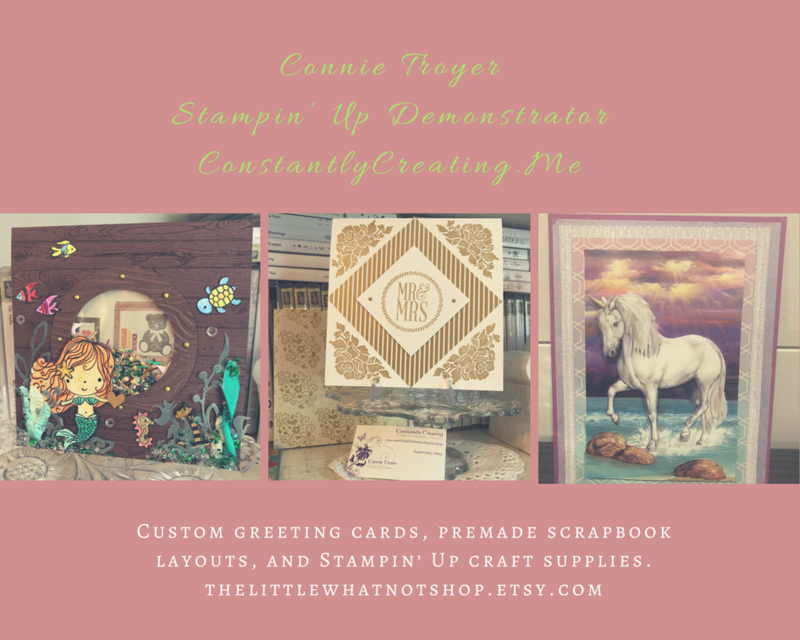 So because I love square cards but don’t generally want to mail them, I give them away in person a lot or I make them for people who will be doing the same. This particular card happens to be a 5×5.5 size. The cat paper I glued on top of the Lucky Limeade card base is from KI Memories (“Pet Shop Here Kitty,” 2022, (c) 2008), and it is awesome. It has this great pearlized, creamy metallic sheen to it. (And I apparently got it on clearance for $.10, now that I dig it out so I can write up the brand name. Which is even more awesome.) I distressed the edges of the paper a little bit before gluing it down because I also have a thing for distressing stuff. At this point I left the back part of the card and went to the front. I stamped the large cat stamp from Close to My Heart (“Cozy Cat Occasions” A1140) in Stampin’ Up Craft White ink (yep, just plain old “White,” from a long time ago) on a textured tan piece, and I think I heat-set it. They dry faster and better that way. 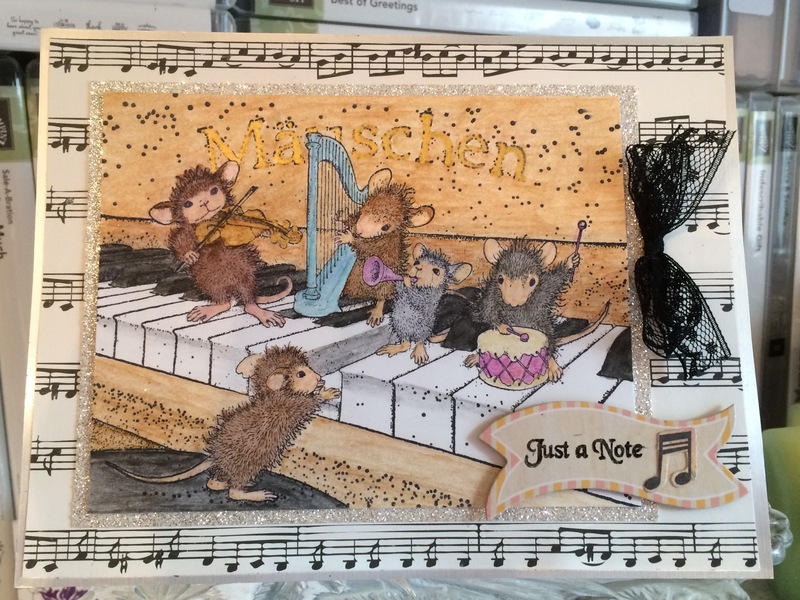 Then, being a new cardmaker and not having things like watercolor pencils, shading techniques, any shading knowledge at all, etc. (my, how things have changed! ), I just colored it with a couple of Stampin’ Up Markers and then used Waterfall Stickles and Gold Smooch Paint on the collar. I matted the tan piece with a miscellaneous light blue/turquoise color before stamping the “Hope you’re feline better” sentiment and doodad lines on white cardstock in SU Tempting Turquoise ink and hand-cutting it into a banner. I then hand-stitched the banner onto the tan/blue pieces with embroidery floss (because I’m also a cross-sticher and have scads of it around here). 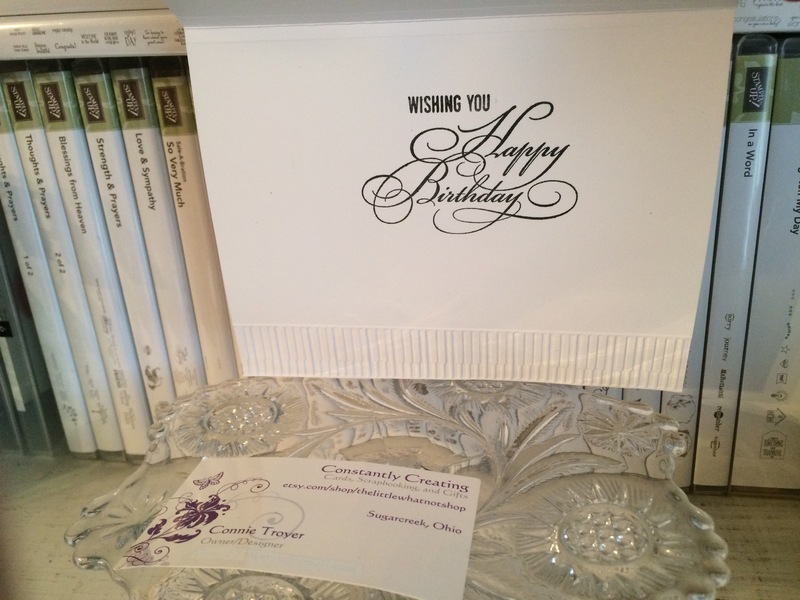 If I remember correctly, I was having trouble figuring out where to place the sentiment on the card. I didn’t like any way I tried it until I just decided it would have to branch out, literally. I took a Lucky Limeade cardstock remnant and placed it behind the horizontal mats for some height variation and visual interest. 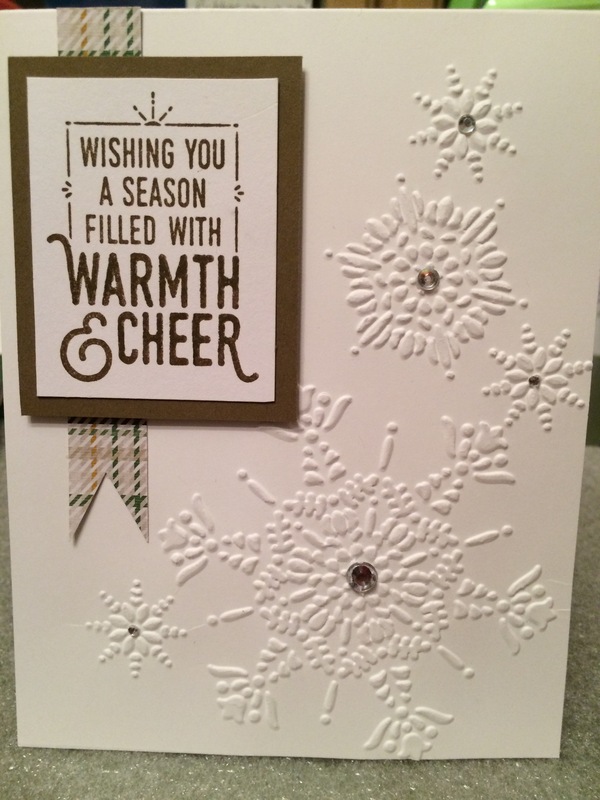 Finally, I grabbed a remnant of the hand-punched border piece I’d done for the inside of the card–I hate to waste anything, and this was what I had cut off–and I pinned it to the top of the center pieces with a WRMK glitter brad. That little section reminded me of a flower, and I just couldn’t throw it away. 🙂 I did not glue it down, so it swings a little bit as the card moves. That’s it! Pretty simple–just a bunch of rectangular papers and a few details. Just like a mini scrapbook page. 🙂 Happy to report that she loved it. But then, she was a cat owner. 😉 Thanks for stopping by!